Concept 230 is a Premium 2.4 mil Calendered gloss white vinyl digital media with a grey permanent acrylic adhesive on an air-egress liner. This film is designed to accept a variety of solvent-based inkjet and UV curable inks common to wide format digital printing systems. The grey permanent adhesive offers excellent opacity and exceptional repositionable qualities. 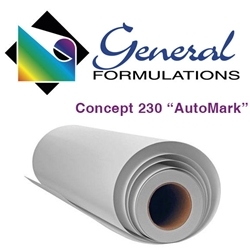 The General Formulations AutoMARK Concept 230 Premium 2.4 mil calendared gloss white vinyl digital media is specifically engineered for use in most vehicle wrap and decal applications. The 90# air-egress liner allows for good lay-flat and air-free application. Concept 230 Premium 2.4 mil Calendered gloss white vinyl digital media is designed to be applied to corrugations, riveted surfaces, flat and slight to moderate curves. The construction can be used on vans, trucks, sedans of all sizes, fleet and recreational vehicles. Application surface should always be cleaned, tested and checked for defects before applying AutoMARK Concept 230 digital vehicle wrap media.